Kalim beach neighbours lively Patong. It is situated at the northern end of Patong Bay. Kalim is building a reputation for its fabulous villas nestled in the hillside and above the beach and for fine dining experiences. Our Kalim villas refect this with the area being much more serene than Patong, but still near enough to the action. Kalim Beach is situated at the far northern end of Patong Bay, it is a great location as it is only 5 minutes from the lively action in Patong and 10 minutes from the quieter Kamala beach and 15 minutes to glamorous Surin. Kalim is approximately 45 minutes from Phuket airport. Kalim is much quieter and more tranquil than Patong, an escape from the lively crowds, but near enough to get back to the heart of the action if you desire. Kalim is is building a more sophisticated reputation than Patong, with several options for fine dining and the creation of high end villas positioned in the mountains above the beach. A great place to unwind. 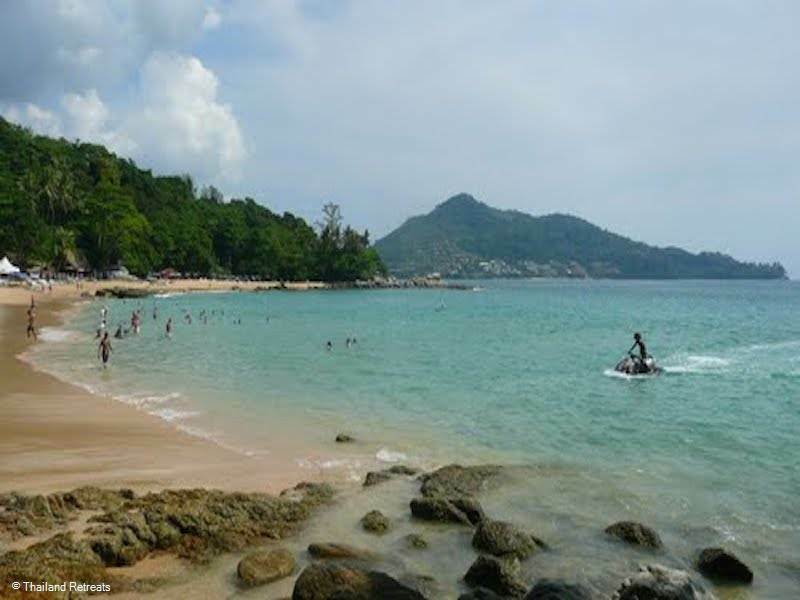 Kalim beach itself is a charming sandy beach, but it does have rocky outcrops. At high tide, beware of the rocks and coral when swimming. At low tide the beach is great for exploring to discover living sea creatures amongst the coral. Remember to wear reef shoes to avoid injury. You should be able to observe sea cucumbers, starfish and other delightful sea life and shells - creating life long memories. Kalim beach is also a surf spot between June and October. From around 4pm there are a number of vendors selling delicious street food, from fried chicken to mango smoothies. Kalim has an excellent selection of restaurants to enjoy brunch, fine dining, beachside sunsets and authentic Thai food or award winning international cuisine. Kalim is fast building a reputation for delectable cuisine. Here's a selection of a few that should be on your list to discover. This rooftop terrace is part of the Indochine resort, the beach club is centred around a swimming pool and has panoramic views. Chill out on the cabanas - its open into the evening and serves up a range of food including Asian and European and you can even enjoy drinks in the pool. This elegant beachside restaurant has won its own share of awards and serves Italian and Thai specialities. It a great spot to soak up the views of Patong bay and enjoy a chilled glass of champagne or a sunset cocktail. The award winning Acqua restaurant serves up a taste explosion from Italian born chef Alessandro Frau, menu highlights include tuna and swordfish carpaccio and maine lobster a la rossini with truffle sauce. This lovely restaurant is nestled deep in the hillside above Kalim bay serving modern Thai cuisine. Menu highlights include chicken marinated in honey, shrimp cookies and sea bass with lime or ginger. The restaurant decor is eclectic, designed by Australian artist John Underwood. Food is created by chef Daniel Isberg and includes a special weekly 'chefs dinner' with a four course tasting menu. Drinks served by mixologist Thomas Alexandre - try the Autumn Martini. Kalim nightlife is low key and centres around dining experiences and at many of the restaurants you are welcome to visit to enjoy a sundowner and stay for late night drinks. Patong is just a short distance away and easy to get to from Kalim. Check out the Patong nightlife section if you are looking for something more lively. This bar and lounge is part of Lims restaurant and is a great place to chill with a cocktail. Twice a month there will be a special party on this beachfront bar which is a tiny 20 metre beach between Kalim and Kamala.